Have you or a dear friend had to make the difficult decision to put a beloved cat to sleep? Are you unsure what words of sympathy will help when grieving for their lost friend, or having a hard time coming to terms with your decision? Where I'll Always Be is a beautiful, lasting memorial pet poem for those grieving for a pet. Written from the heart of the cat, this comforting poem assures the owner that all was done in love, as has always been done, and the two of them will always remain together in their hearts. 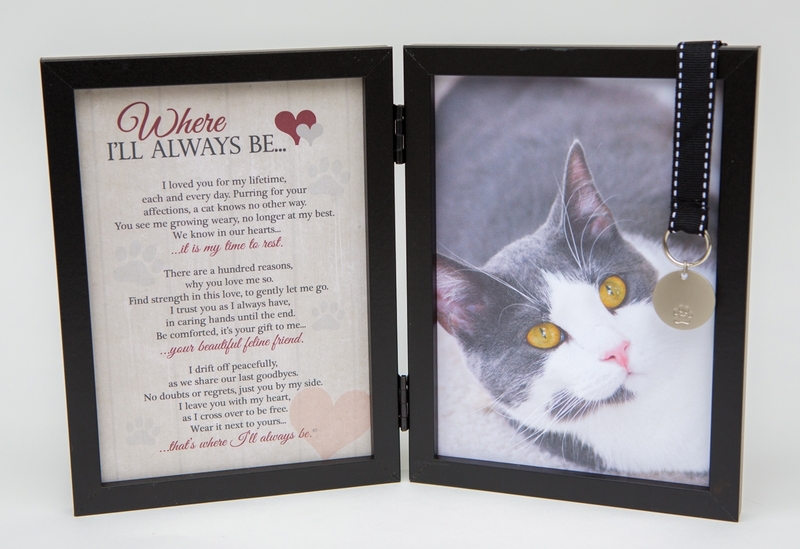 Our 5x7 black double tabletop frame with Where I'll Always Be features a space for a 5x7 photo of a beloved pet. A black/white stitched ribbon holds a silver engravable disc with a pawprint stamp. The disc can be left as a cherished accent, replaced with the pet's tag or engraved. A true customer favorite when suffering the loss of a cat. Our new pet memorial poem written by The Grandparent Gift Co. owner, Teri Harrison, "Where I'll Always Be" is available with a dog or cat sentiment. We hope you love the sentiment and it brings you and your family and friends comfort. All copyright laws apply, Author, Teri Harrison, The Grandparent Gift Co. I truly love your products, now and in the past , especially â€œthe Paw Prints ðŸ¾ left by you !